Our next CM talk should be a good one. 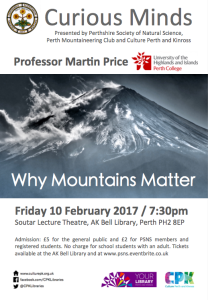 Professor Martin Price heads the Department of Mountain Studies at Perth UHI. He is a respected World Authority on Climate Change. This talk is a joint presentation with Perth Mountaineering Club and Culture Perth and Kinross.